Lee Westwood ended two strokes adrift of joint leaders Luke Guthrie and Michael Thompson going into the final day of the Honda Classic in Florida. England's Westwood started the day three shots off overnight leader Guthrie but his level-par 70 took him to six under. A round of 72 for fellow Englishman Justin Rose leaves him a further two strokes back on four under. The American joint leaders are both chasing a first career PGA Tour win. Guthrie, 23, lost the outright lead after 27-year-old Thompson, who shot 70 to Guthrie's 71, birdied the par-five last to join him on eight under in windy conditions. Westwood made one birdie and dropped three shots on the front nine, but made steadier progress after that with birdies at the 14th and 17th. He is tied for third with Australian Geoff Ogilvy, who birdied the last. 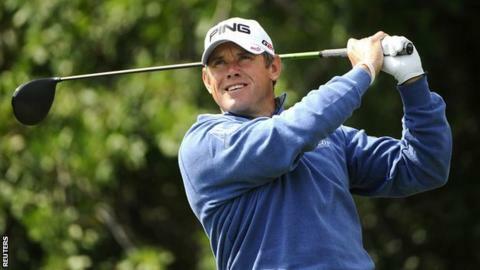 "I like my chances regardless of the conditions," said Westwood, the world number nine. "I'm playing nicely. Just got a couple of mistakes I made today, but other than that, I'm playing solidly. I have to start making a few putts. I had a lot of chances to make putts that just grazed the hole. "I like being out late on a Sunday and having a chance." The Worksop-born Westwood has recently moved to Florida to further his career and says the switch is working well. "I was just getting frustrated with the weather in the winters in England, not being able to work as hard as I would like and coming out at the start of the year really rusty," he said. "I wanted to come and live in the sunshine. "Everyone is loving it so far, my family have settled in well which was my main worry really, that the kids weren't going to settle at school, but they have lots of friends already." Tiger Woods shot 70 to remain level par for the tournament while Northern Ireland's Graeme McDowell lost ground after four early dropped shots led to him signing for a 73 while left him six off the pace on two under.